For all you researchers out there, we’ve just launched a new project in collaboration with Stanford Medicine X to further research in healthcare social media. The database is powerful for exploring past research and looking for works to reference and cite. You can search for specific topics, authors, journals or even rank the articles by Impact Factor. Selecting an individual article will reveal more information including DOI, PubMed, Altmetric and APA style citation. 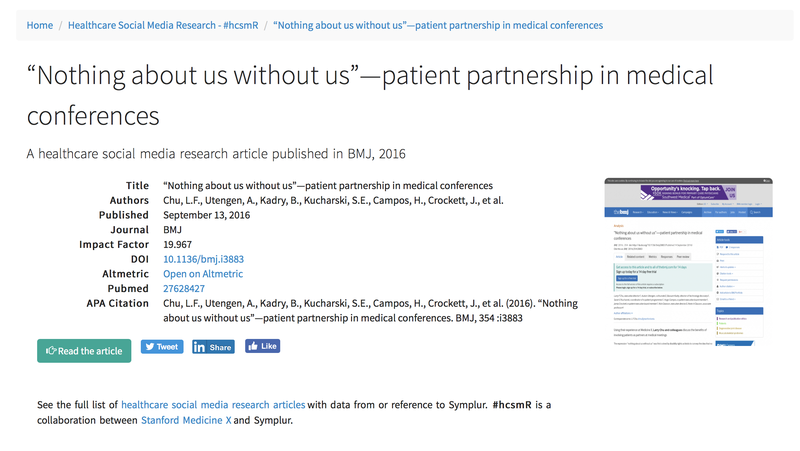 Shortly after launching the Healthcare Hashtag Project over 6 years ago we got approached by academia wanting to do research in this area together with us. That was the start of our internal data mining capabilities. Then, about 3 years ago, we made our private analysis tools available to all 3rd parties through our Symplur Signals platform. Today, we’re proud to have had world-renowned universities, government organizations and individual researchers use our platform in their research endeavors. We’re now counting over 150 published journal articles and 50 other publications including academic books using or referencing Symplur data. Yet there is so much more to discover in these datasets and communities. There are voices here waiting to be heard, with insight and experience yet to be properly understood by those who can take action. Let’s continue our efforts in searching for and giving strength to the quiet voices.